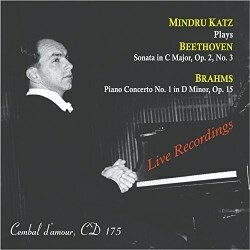 Cembal d’amour has shown consistent devotion to the art of pianist Mindru Katz, which is hardly surprising given that he was the teacher of the label’s owner Mordecai Shehori. The restoration of commercial discs has been significantly augmented by a raft of live material, often as not made in-house or via cassette recorder. There are two examples here in a mini-series that charts one Beethoven sonata performance with a Brahms Concerto – the companion volume is on CD180 and pairs the Moonlight with Brahms’ Second Concerto. Here we have Beethoven’s Op.2,No.3 sonata, a major early statement of breadth and power. Katz’s sonorous bass and dextrously crisp finger work irradiates the music with characteristic control. He sculpts the first movement’s turbulence, its tricky broken octaves in particular, with allied propulsive rhythm. In contrast, he draws expressive left hand cross-currents in the slow movement, ensuring sufficient colour is observed. Doughty but crisp – not opposites in Katz’s hands – the scherzo is attractively characterised and the finale goes very much con brio, excitingly but cleanly dispatched and rounding off an excellent performance limited only very slightly by the circumstances of the 1971 recording. Seven years earlier he performed Brahms’ D minor Concerto with Josef Krips and the Israel Philharmonic. The bass frequencies are rather foggy here and aural muddiness does blunt articulation somewhat. However, Krips and Katz make a fine team taking sensible tempi decisions, ensuring rubati are controlled and never indulgent and projecting the heroic and more intimate elements of the concerto with great acuity. You’ll need to raise the volume in the slow movement fully to catch wind themes, where one or two of the string themes can come across as somewhat statuesque and lacking in phrasal plasticity. But against that the movement, which seems slow – but isn’t measured by the clock – is made to seem so by virtue of the control of dynamics and phrasing evinced by both men. The finale’s fugato is strongly delineated, Krips grants the Israel Philharmonic’s winds their head, and Katz’s pianism is heard at its most trenchant here. Granted the inevitable sonic limitations, this brace of performances shows Katz’s authoritative musicianship at work at a high digital and interpretative level once again.